April showers may bring May flowers, but in our gallery May was a month blooming with inventive and creative works from students all over Bainbridge Island. 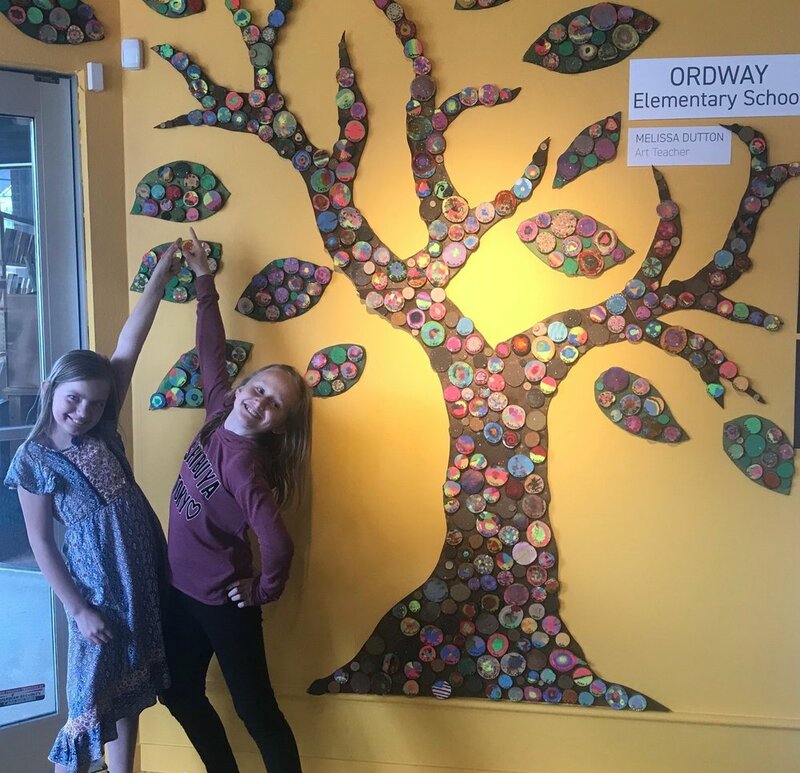 Proud Ordway students point out each of their pieces on the Ordway group artwork. It started with our Elementary school show during the first half of May, when the young artists got a feel for what it's like to be a professional artist for a couple of weeks while their show was up on our walls. Many of the youngsters were in attendance with their families at our usual First Friday opening reception party. The second half of May brought in the High School Student Art Show. The dynamic showing of works in many different mediums in 2D and 3D included winning entries from the Spring Arts Fair (held the previous week at Bainbridge High School) as well as other pieces selected by the art teachers of Bainbridge and Eagle Harbor High Schools. The Spring Arts Fair was our first opportunity this year to shower some young talent with cash prizes. The Art Project handed out a total of $1,525 in prizes at the fair, distributed among 38 artists in several categories. Gallery visitors enjoy the High School Student Art Show. Students and friends await the announcement of the BOSS (Best of Student Show) Award winners. Our second opportunity came during the high school artists' reception at the gallery, during which we awarded 16 BOSS Awards (Best of Student Show) totaling $1,200—an amount donated annually from an anonymous donor for this event. Selecting the honorees seems to get tougher every year, as the creative pool of young talent is always quite deep. With one last chance to encourage young artists to keep honing their skills beyond high school, we awarded our annual Scholarships—three of them—at a separate juried event. With 10 applicants, the three winners were awarded a total of $4,000. We love the youthful energy of May at The Art Project. It reminds us why we are here: to encourage the appreciation and development of visual artists early and often; to keep the creative fires burning at all ages, and to honor the hard work that is the labor of love called art.